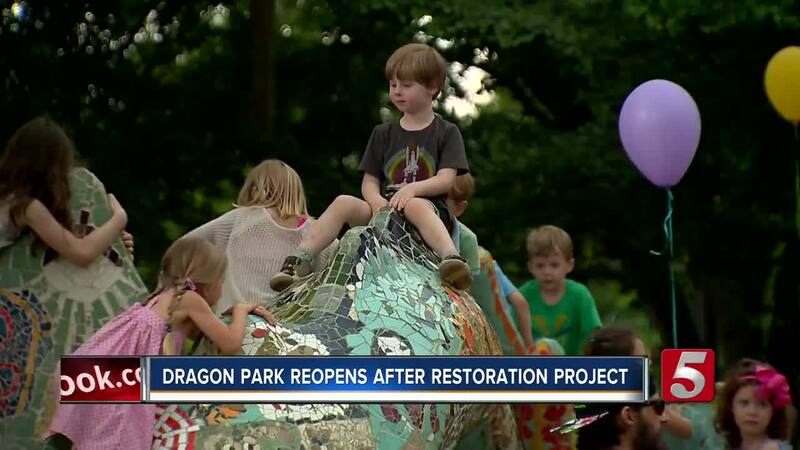 An iconic dragon at a local park has been restored. To honor a community's fundraising efforts, a reopening ceremony was held Sunday. Neighborhood kids shouted, "Long live the dragon!" As the ribbon was cut, children of all ages ran to the playground for the first time in two years. This reopening wouldn't be possible without five-year-old Alex Angus. "He loves the dragon," Sarah Angus said. "He was so heartbroken when it was closed off." According to Sarah, her son went door-to-door raising "a dollar for the dragon." "It really took off and he kept going with it, and it's been a real wonderful experience," Sarah said. Nearly $200,000 was raised for the restoration project. "This experience is going to be life-changing for him and for us as a family just because it shows that he can actually make a difference on the things that he cares about," Sarah said. The mosaic dragon at Fannie Mae Dees Park was falling apart several years ago, forcing Metro Parks to close the area in 2016. One mom said her son has been waiting to climb to the top of the dragon. "There's a challenge in getting up to the top of something like this, and he's been waiting to do it for two years," Hannah Cassidy said. An artist built the dragon in the 1980s. "I think it sparks his imagination right? It's all about adventure," Cassidy said. This dragon has become an icon for the Hillsboro West End neighborhood. "Behind me is probably one of the clearest indicators of what a great neighborhood in our community can do," Mayor David Briley said. Briley said the dragon symbolizes revitalization in our city's history. "Back in the 1970s, our city started to see its neighborhoods reinvigorated. No neighborhoods more so than this neighborhood led this movement," Briley said. So as kids climb and play, little Alex said life is "good."